Followers of this blog will have noticed that I have been conspicuous by my absence in recent weeks. Most bloggers, especially those like me who have been keeping noses to the blogging grindstone for a number of years, feel the need for a break now and then, no matter how much fun it all is. Sitting staring cross-eyed at a visually attractive wall, hand clutching a cup of tea, is a great way of chilling out and revitalising, I find. Throwing in a little therapeutic travel also helps! So, after a week of travel therapy, I am now home. Our last port of call was the historic English market town of Salisbury. 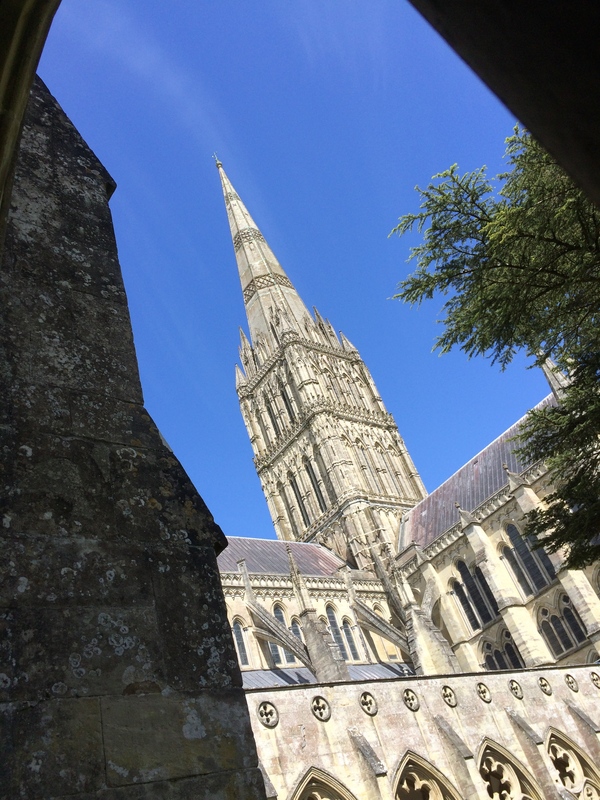 Much though we loved Salisbury, its world-famous cathedral, unsurprisingly, was the highlight: awesome, in the pre-social media sense of the word. I was especially moved by the Trinity Chapel and its magnificent Prisoners of Conscience window. And – I found the statue of the Black Madonna. Here is Jamie, from that excellent blog Sophia’s Children, on the topic of the black madonna archetype...”….But the real surprise, as I wandered through the beautiful cathedral was coming upon a chapel dedicated to prayer for ‘prisoners of conscience’, which featured a stunning stained glass window. Looking over this chapel, dedicated to mindfulness of and prayer for those who are being held prisoner throughout the world, was a dark madonna. We also took some time to wander through the cloisters and the extensive grounds around the cathedral, soaking up the atmosphere. Salisbury Cathedral is visually stunning, not least because of its magnificent spire. I hope you enjoy this unusual view! One of the surprises of our visit was this: despite the constant traffic of noisy schoolchildren, mingling with tourists of all races, colours and creeds, it was possible to find contemplative spaces. For me, sitting quietly in Trinity Chapel, contemplating the beauty of its magnificent window which offered such a powerful, poignant message, was something I treasure and will not easily forget. Where would we be, believers or not, without the power, grace and inspirational quality of those spectacular mediaeval monuments? 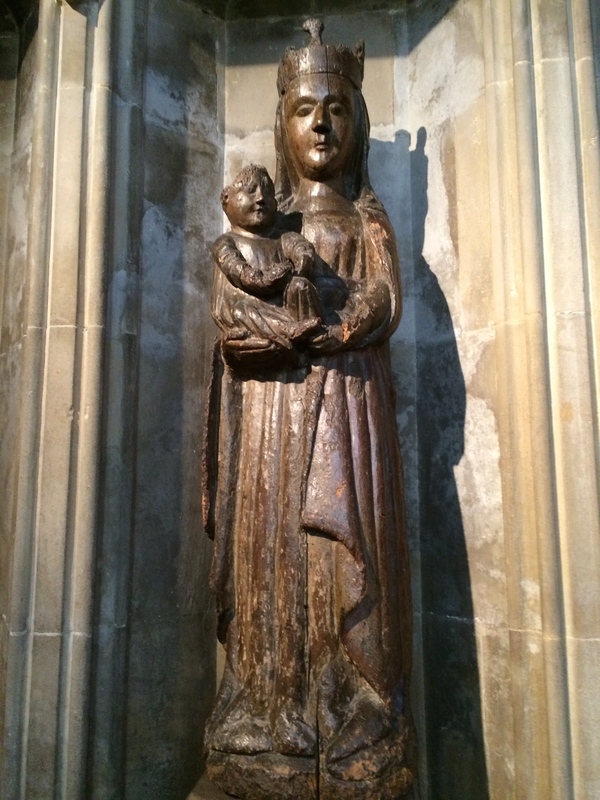 This entry was posted in Places of Healing and tagged Black Madonna, Prisoners of Conscience, sacred spaces, Salisbury Cathedral UK, Trinity Chapel Salisbury Cathedral. Bookmark the permalink. Glad you enjoyed your re-visit, Jamie, and thanks for calling by. Yes, I’d be most happy for you to reblog the post. Thanks! It’s so important to take timeouts and get still and quiet, especially for highly-sensitive people. Your choices were good ones, and I am sure you glowed with serenity as you recharged your batteries. I am extremely lucky to have a place of serenity where I live on the river. I also have access to lots of wooded areas free from the sounds of civilization. Life had fun taunting you on your return, but now maybe it will tease someone else. My friend Bob wrote a post a few days ago about spilling his coffee (third cup!) on his laptop! Welcome back after your respite from blogging. Sounds like you had a wonderful get-away Anne. I zoomed in for a closer look at the stained glass windows…spectacular! I also enjoyed reading the interesting story behind the black Madonna. . Thanks, Bev, I hope to get over to your site and check out what’s the latest…yes, I love Jamie’s research on the black Madonna. 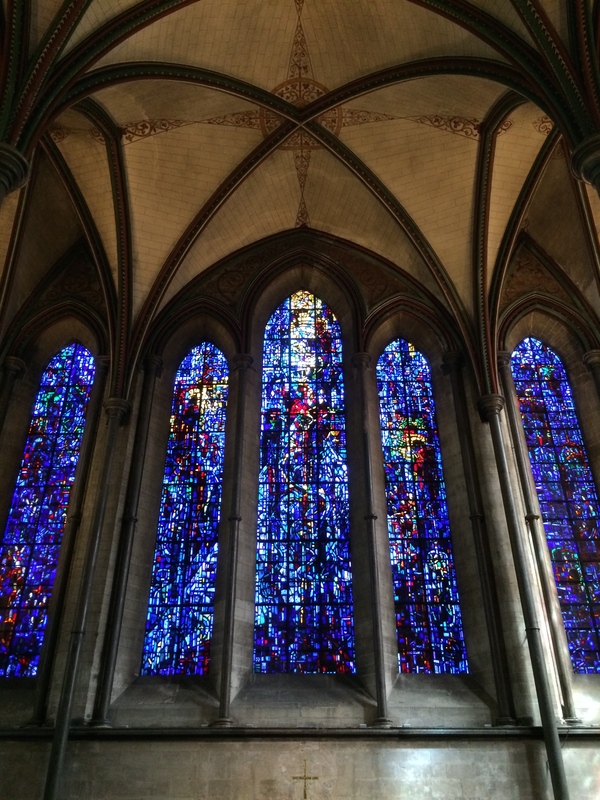 Of all the places I visited in England, Salisbury, both the cathedral and the plain, were at the top of the list. Some places, like St. Paul’s in London, are interesting for the history, and some, like the Christopher Wren parish churches, are a different kind of sacred space. But Winchester, Salisbury, and Yorkminster are wonderful santified spaces. I do love them all! I’m so glad you had a chance to get away, and I hope all’s well — that you’re refreshed and (spilled tea notwithstanding) ready to get back at it! Thanks, Linda – nice to know we have both trodden the same holy ground with similar appreciation! Yes, it was refreshing…but I have that longing to sit staring out at the sea, which warns me that I need to create ‘time out’ in my week in order to let the beginnings of the next book emerge ( I hope…) from the depths. A fabulous tour for your readers, Anne, thanks!